This is the members that we have records of from the original Old Farts Car Club roster from the state of Alabama. This the only existing roster that we could find for the Old Farts Car Club from the state of Wisconsin. Below are the names from the state of Wisconsin. See if your name is on the roster from Wisconsin. Original members from the state of Wisconsin are on the left. See if your name is there and if not, lets put it on. Sent us stuff of interest from the state of Wisconsin if you know of any and we will post it forthwith. That means right now. Setting up the tent at the Back to the Fifties show. 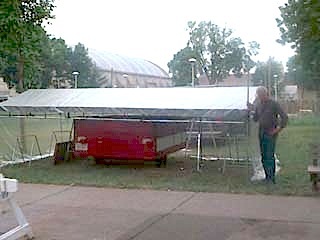 This is when the tent was lowered for installing the tarp, then we cracked her up and the shop was open. I miss those days. Looking for an old Coleman camper as we speak.